Involuntary Reactions. Expecting the Unexpected. We are calling volunteers for a still photo project in conjunction with Agency-X here in Kansas City. This Friday, February 12, 2016, we will be shooting a series of still photographs in our studio at 10000 Marshall Drive in Lenexa, KS, and we need people who are willing to stand in for the shoot. Whether you have experience in front of the camera or not, this is a great opportunity to participate in a really fun project. In exchange for your willingness to stand in for us, we will be offering you images for your own use. Those images will include any that we end up using for the project, as well as a free headshot, if you're interested. Both images will be professionally retouched, and delivered to you in high resolution. If you are interested, or if you know someone who might be, please comment below, or contact us directly, here. We are taking a limited number of participants, so first come, first serve. Thank you... we hope to see you soon! Some of my favorite images come in an often unexpected manner. When studying commercial photography I feel like the sentiment was often pounded into me: "Shoot for Yourself!" Part of that is obvious: continue to create your own work apart from the work that you're hired to do. But, the secondary meaning behind the phrase reaches into those paid assignments, and it is this: produce what your client wants, make their vision come to life, and then... play. Often times that creative spark comes after you've done what you've been hired to do. And when you're free from the constraints of fulfilling the creative vision by which the job was born, that's when unexpected things start to happen. Sure, they don't always come to fruition, but when they do, new ideas are born... new vision is developed, and in the end, you, and your client, may have something that is altogether beyond everyone's expectations. The more that happens, the more you become the creative force that is combining with your clients' vision. And then, people are hiring you for how you add to the creative process, not just how you excecute someone else's. All that to say, the above image was produced during a shoot for a men's underwear line. There were no plans to shoot anything cropped above the model's waist, or even above his thigh. And there certainly weren't any plans to produce a photograph with this much contrast, or even in this style of imagery that is more of a portrait than anything. BUT, after we completed production on the full line of underwear, it was time to play. We still had another hour in the day, so I turned around and moved from the cyclorama to a small white wall at the back corner of the studio. I went from 5 lights to 1. I went from a nice, soft octabank to the sharper focus of a parabolic umbrella (Paul C Buff's PLM is one of my favorite modifiers to date), and shot some more dramatic portraits. 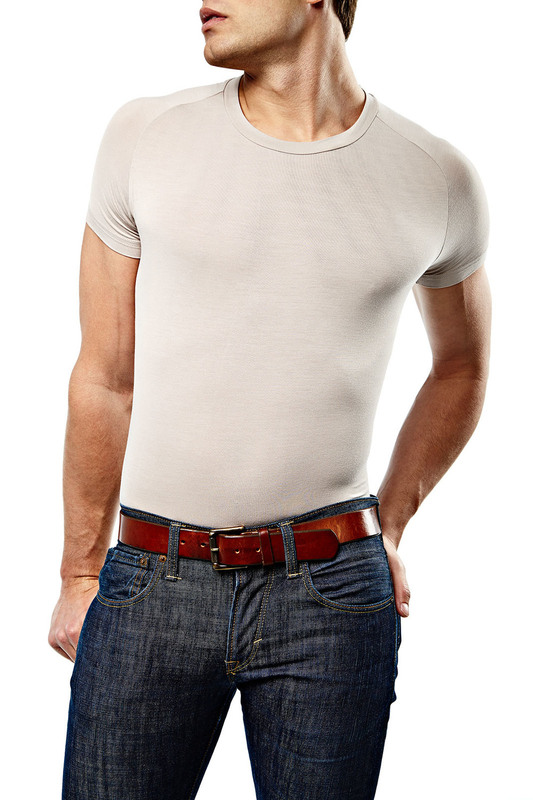 This very image ended up being selected by the client for use in advertising their tee shirt line. So, go do what you're hired to do, and then have some fun. My guess is that you'll be rewarded one way or another! I've been shooting head shots for Muller Bressler + Brown for several months now, ever since my first job with them back in April of last year (see it here). There are also some fun headshot outtakes featured elsewhere on my blog, but here I'm featuring one of the actual deliverables. There's something about this image that I love. Maybe it's the bow tie, maybe it's that Tae was a super nice guy that I enjoyed getting to know a bit during the shoot (also a fellow photographer)... maybe it's both of those things... but there's something more. I think what it is is Tae's expression. Some sort of inner joy seems to be exuding from his slight smile, his raised cheeks, and his focused, yet inviting, eyes. Of course, the bow tie is pretty fantastic! I just completed the post production on our second shoot with Mr Davis Clothing (click here to see the first round images from last year). They’re out with three more products as well as a redesign of their initial product launch. I just want to reiterate the quality of this product, and the quality of the individuals behind the product. Great people behind a great business behind a great product! Stoked to be working with these guys again. Take a look at there website here: mrdavis.com. All images on the site, courtesy of yours truly. ...Okay, so they didn't design it, but they hired those that did, which is cool, right? 360 Architecture is one of the biggest architecture firms on the planet. In fact, they are known all over the planet, because they do amazing work both in the United States, as well as overseas. They specialize in everything from corporate installations to commercial headquarters, to professional sports stadiums. They are crazy creative, and crazy good at what they do. I recently had the pleasure of producing head-shots for nearly everyone at 360… all 150 of them! A few weeks later, I was asked to photograph some of their design work in town. 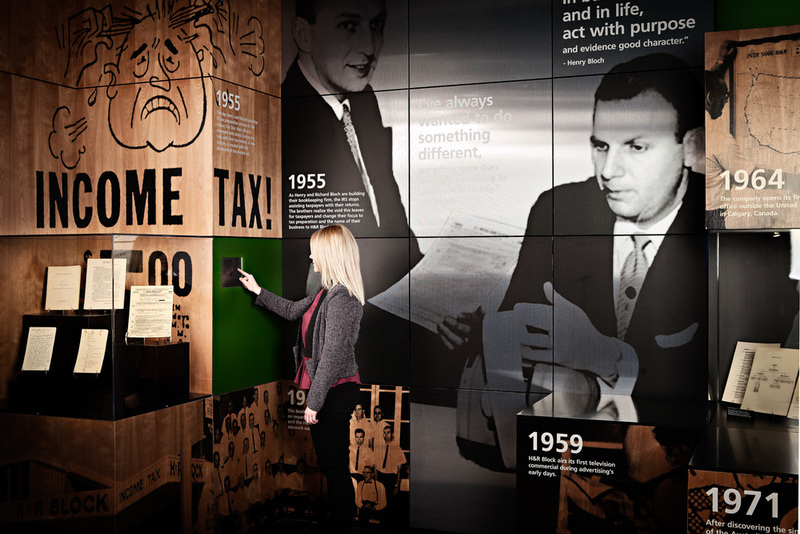 One of those jobs was a “History Wall” installation at the H&R Block Headquarters in downtown Kansas City, Missouri. Honestly, I didn’t expect to see something so cool outside the lobby of a building that houses so many accountants (no disrespect... I could not do what you do), but I was very impressed, and I enjoyed making images of the space. One of my favorite jobs to date was working with The Centre at Lexus Escondido and Elevator Agency to build all of the imagery for The Centre’s new brand (all of the images found on their website--including those for Vintana Restaurant--were taken by me, and you can read about that here). Not only did I get to work with many of my good friends (including my assistants, the creative director, and the client), but the job was on a fairly massive scale spanning over 4 days (a few of them 12 hour days), and I love the energy that goes into, and comes out of, that type of work. One of the rooms that I shot for the original branding was recently gutted and rebuild as a “Technology Center” for the Lexus dealership on the main floor of The Centre. They called me in for an estimate on the job and then quickly accepted that estimate. I was stoked to be working with these folks again… especially on a project like this one! 1) I kind of have a secret crush on Lexuses (is that the correct plural for Lexus??). 2) The room that they build out as the Technology Center was a pretty amazing combination of architecture, design, and modern functionality. The room was designed by StudioMyID, an interior architecture and design firm based in San Diego, CA, and it features an iPad table, a 60” flat screen TV, a 40” touchscreen, a ginormous video wall, a small showroom, and a circle inlaid on the floor to park a car. The whole room centers around getting customers excited about new technologies build into Lexus’ products, and training them, one-on-one, on how to use those technologies. What’s more is that the room is placed right outside of the full bar and lounge area that is part of Vintana Restaurant, so that potential customers can easily be enticed into a room that lets Lexus shine. The Technology Center is a fantastic idea, and one that has been executed very, very well. Congrats to the folks at The Centre… I hope our paths will cross again soon! For those technically minded, like me, that like to learn more about the process behind what makes an image, I will say this: A lot of the work on these images was done in post production. I did light the scene with strobes wherever I needed them, but I also bracketed exposures and did a lot of painting with exposures, masks, and adjustment layers in Photoshop. The pen tool was my best friend in some of these images--just about everything is pathed out so that I could use different exposure, different color balances, different curves, etc. on each individual element. A lot more time went into post production then it did actual production, which seems to be the case more and more for me. I actually like the creative side of post almost as much as that of the actual lighting, directing, and shooting… so I guess that works out well.